For many years, the American Heart Association and other Big Hitters in medicine have extolled the health benefits of a very low salt diet. Patients who have known heart disease were commonly counseled to eat a very low salt diet of less than 1,500 mg a day (compared to the average U.S. daily salt consumption of 3,400 mg a day). I experienced this myself. When I was growing up, my father had three separate heart attacks and, among other things, was told to eat low salt. So, for several years, that is what my mother cooked for all of us. Very Low Salt Diets as a treatment and preventative for heart disease has become the prevailing wisdom. Since these less-than-1,500 mg-of-salt-a- day-diets were so commonly prescribed in the community, most jails and prisons had to have such a Very Low Sodium Diet among the various medical diets that could be ordered by a practitioner. However, I personally have never been a big fan of these Low Salt Diets in general and especially in Corrections. There are two reasons for this. The first, as I can tell you from my own experience as I was growing up, is that very low salt diets are not very palatable. Most people find the food quite bland and will not eat it long term. Correctional inmates experience this, too, and commonly sabotage the diet by liberally salting the Low Salt Diet at the table (as I myself used to do) and by ordering lots of salty commissary foods like Ramen, and chips. We practitioners commonly sabotage the Low Sodium Diets as well, by ordering medications with lots of attached sodium, such as naproxen sodium or omeprazole sodium. So I challenge you to check the commissary purchases and prescriptions of the inmates at your facility who are prescribed a Low Salt Diet and find out how many truly ingest less than, say, 2,300 mg of salt a day. I guarantee, it won’t be many. The second problem with the Very Low Salt Diet hypothesis is that the science for its efficacy has been pretty tenuous. Basically, eating less salt lowers blood pressure slightly in some individuals. Since people with lower blood pressures tend to have fewer heart attacks and strokes, then, the theory goes, eating less salt will lower blood pressure which will thereby decrease heart attacks and strokes. The Magic Number for salt consumption was pegged at less than 1,500-2,300 mg a day, compared with the average U.S. daily salt intake of 3,400 mg. But until 2006, no one had studied salt consumption directly. from The Centers for Disease Control and Prevention’s Institute of Medicine, which analyzed the data directly linking salt consumption to death, heart attacks and strokes—no blood pressure middle-man. It turns out, according to the CDC, that all of these bad things (death, heart attacks, strokes, congestive heart failure) did increase with salt intake greater than 7,000 mg a day—but also (and who would have guessed this) for salt intake of less than 3,000 mg a day. The report has already come under criticism. Most of the criticism I have read so far has been of the “I don’t believe it” variety. But one good observation, in my mind, is that the most common source of big-time salt in American diets is fast food and processed food, rather than overly salted prepared foods. I think we all will agree that most fast foods and processed foods are not the best health-wise, and for more than just their excessive salt content. This is true in jails and prisons, as well. The biggest source of excess salt in most inmate diets is the junk food found in the commissary, not the food prepared in the kitchen. That is certainly the case at my jails. The prepared meals in my jails do not have a huge amount of salt. So what is the take home message from the CDC report? 1. It may be OK to get rid of your Very-Low Salt Medical Diet (1,800 mg a day) as long as the standard diet served to your inmates has reasonably low salt content, like less than 3,400 mg a day. It probably does, unless you are serving lots of processed foods. 2. If you do order Very-Low Salt Medical Diets anyway, perhaps it would be prudent to check commissary purchases and NSAID prescriptions to make sure that the patient is really ingesting low amounts of sodium. If, despite the Very-Low Salt Diet, your patients are still ingesting over 3,400 mg a day, what is the point of the diet? It is a lot of time and effort that is not accomplishing anything. 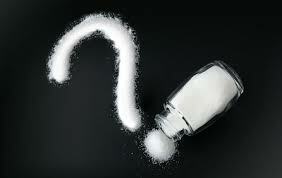 How many Low Sodium Diets do you prescribe? What do you think of the CDC report? Please comment! This entry was posted in Comfort items, Food, Inmate issues and tagged correctional medicine, Diet, evidence based medicine, inmates, jail medicine, jails, Low sodium diet, Nutrition, prisons, Salt on May 16, 2013 by Jeffrey Keller MD.